But at any other time of year it’s still great and easy to get to. As well as the stuff i’ve listed here to see, do or eat i highly recommend asking a local for tips too. No one knows a town like a native and Kileknny people are proud of their great little town and happy to point you in the direction of a gig or shop or café. There is motorway so it’s easy to drive to from most parts of the country. Google maps knows better than i ever will. If you’re not driving Bus Eireann will get you there as will J.J. Kavanagh’s bus service. J.J. Kavanagh’s has free wifi on board a lot of it’s bus fleet and is generally cheaper than bus eireann. Timetables are here. If you want to splash out on a train ticket book online as you’ll get the ticket a fair bit cheaper. Ticket prices vary at different times of the day and over days of the week so check through a few to get what suits you best. The earliest trains are usually the cheapest in the day. You can check it all here. You can pay by credit card or laser so if even your creditcardless you can get the ceaper option. There is a booking fee but i think it’s only about 50c on laser card so it’s still worth it. 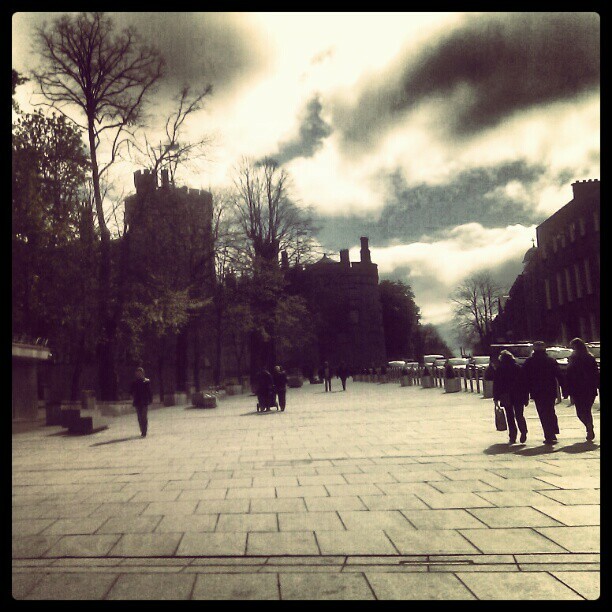 Kilkenny is proud of it’s food and has lots of great cafés and restaurants. I think the best way to find somewhere nice to eat is to ask people when you’re there. But a consistently great place is the Kilkenny Design Centre. Wholesome and tasty and really good quality. It’s also right across from the castle so pretty handy for lunch before or after heading in there. 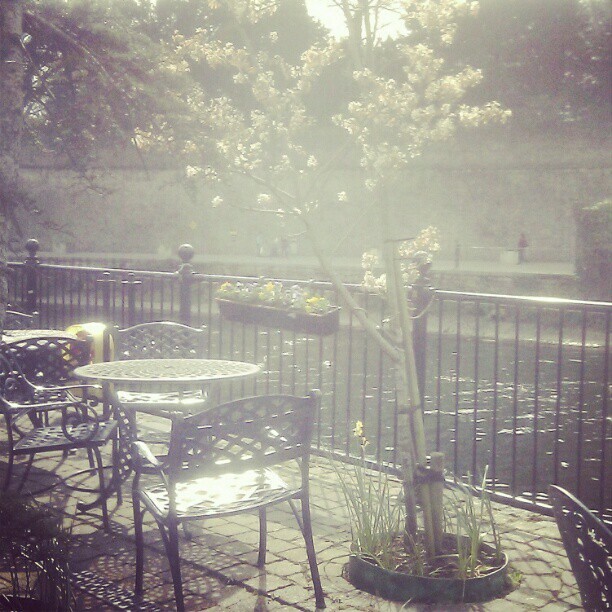 If the weather’s good and you just fancy a coffee with a great view head to the Rivercourt Hotel. 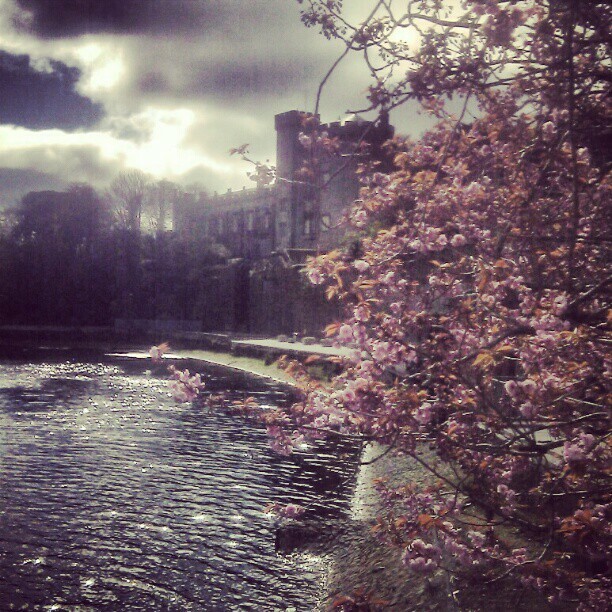 You can sit by the river with a view of the castle above you and if you’re there at the right time of year – lots of Cherry Blossoms in bloom! Unfortunately the Rivercourt Hotel tends to blast terribly cheesy horrible music out of speakers here but if you. Maybe not quite blast, but it does infringe on the beauty fo the surroundings a little. But if you ask nicely they’ll turn it down a little ;) Leona Lewis is great for hoovering / emotioning too on your own at home but it just doesn’t suit coffee on a beautiful riverside! As well as being a great place to eat, the Kilkenny Design centre has a shop of Irish design and crafts products. They often have exhibitions of Irish designers work and you can wander into the courtyard out the back and chek out the stuios and buy from craftspeople who work from there. Kikenny Castle is across the road. The grounds are extensive and also have a great playground if you’re bringing kids. If the weather is good or bad it’s great to walk around. The castle is stunning and worth paying for the tour of at least once in your life. It’s so beautiful and the guides are great and really knowledgeable. Pretty sure this is where i learned about ‘old glass’ years and years ago on a school tour. SOme of the windows still have the original glass, which is every so slightly wobbly looking and makes for more interesting views than the glass we are used to :) you’ll start noticing it other places after seeing it here and it’s such a treat! It’s also full of beautiful wallpapers and furnishings. If you want to go shopping Kilkenny can handle that too. Shutterbug vintage clothing and interiors store is a great place to start and ask the staff here for tips on where else to go, they’ll know the best spots and how to get there. Bridie’s is another gas little place and suits the atmosphere of the old town Kilkenny is. 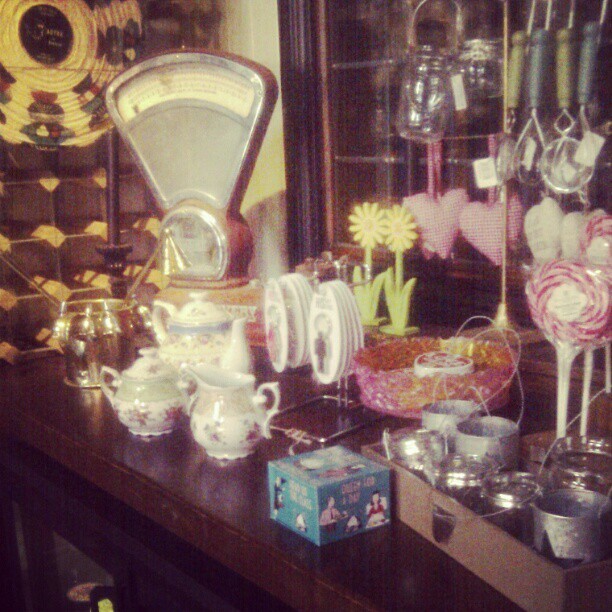 It’s got lots of old fashioned style stuff from sweets to mega boppers! Kilkenny is nice and compact. There are great places to go outside of the town centre but for a day trip you’ll be able to walk to and from all the places i’ve talked about within about ten mins! Great place to fit lots on and hop back on a train or bus or drive home. Have a splendid day! Let me know if you discover something extra special that we can add in here for others to know about! Thanks Elva! I’ll be heading down later in the week and there’s great advice for us city folk taking a wee day trip to Kilk!